So, you’re in search of a good VPN service, but you haven’t quite made up your mind. After all, every provider is touting themselves as the fastest and the most secure VPN, and there are dozens of websites pushing their favorites. That’s why we decided to wade into the fray, cut through the BS, and give you our take on the best (and the worst) VPNs on the market. 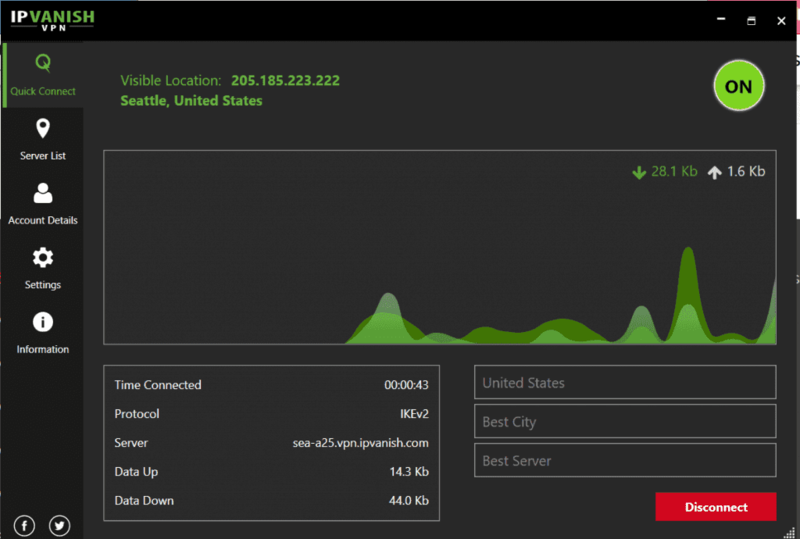 IPVanish has long been one of the more popular VPN services on the market. However, the company’s ownership change in 2017 and its logging controversy in 2018 have led to a slight shift in perception – and some small changes in features as well. In our opinion, these past couple of years have seen IPVanish fall from the ranks of the top-tier providers. From speeds to security to features to price, it’s a VPN service that is good but not great. There are plenty of things to like, but it doesn’t stand out in any particular area. IPVanish’s subscriptions start at $10.00 a month, which puts them around the middle of the pack in terms of VPN prices. With our 20% discount, you can get 12 months for $5.19 a month. That’s a little less than some providers, like ExpressVPN, but still more expensive than a few others, like NordVPN. IPVanish’s 7-day money back guarantee is also a lot less generous than the 30-day guarantees provided by the above competitors, but it’s better than nothing. With that said, is IPVanish worth the price? Well, you’ll have to read the rest of our review to find out! If you’re looking for a quick rundown of what IPVanish has to offer, here’s the gist of it. You’ll find more detailed explanations of these features below. If you’re concerned about your VPN provider’s speed, IPVanish is a solid pick. While the closest server wasn’t actually all that close, we still managed to get pretty respectable speeds, though our ping and upload speeds did take a noticeable hit. Again, this is more an issue of our location than the servers themselves. As you can see, we still managed to utilize a good chunk of our bandwidth while connected. In short, IPVanish isn’t the absolute fastest VPN provider we’ve used, but it still provides solid bandwidths, whether you’re downloading, streaming, or just surfing the web. “Does it work with Netflix?” is one of the most common questions we receive regarding VPNs. And for good reason. Netflix has become pretty determined in recent years to stop users from streaming through a VPN, since it allows them to change their location, access different versions of Netflix, and to avoid bandwidth throttling. Unfortunately, IPVanish is not very good at bypassing Netflix’s blocks. 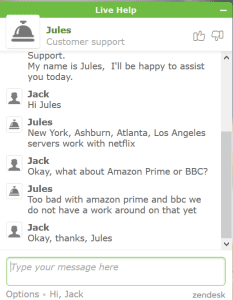 According to the support representative we talked to, the New York, Los Angeles, Atlanta, and Ashburn (near Washington DC) servers are the only ones that work with Netflix. We were also informed that Netflix doesn’t work with Amazon Prime or the BBC iPlayer streaming services.While this is better than nothing, it’s far from ideal. This means that users in the US can’t access other versions of Netflix, users who want to stream US Netflix from another country are going to take a serious bandwidth hit, and even US-based folks who aren’t close to these servers will suffer some speed loss. All of the above combined with IPVanish’s lack of split tunneling for its desktop apps means that folks who want to use Amazon Prime, BBC iPlayer, or Netflix outside of the supported servers will have to disconnect from the VPN entirely. In short, if you’re planning to use your VPN for streaming, we can’t recommend IPVanish. IPVanish advertises themselves as the best and fastest VPN for torrenting. Needless to say, they don’t block p2p traffic – and they don’t place limits on bandwidth. The free SOCKS5 proxy is another neat feature for p2p users, providing less protection but better download speeds. However, there are a few areas of concern regarding IPVanish’s status as a torrenting VPN. As we’ll discuss later in the Security section, their logging policy leaves some doubts. And IPVanish is also based in the United States, which makes them more susceptible to issues regarding DMCA notices, copyright, etc. In short, IPVanish’s hands-off approach to p2p traffic, solid speeds, leak protection, and good encryption make it a suitable VPN for torrenting. But its location and logging history mean we can’t recommend it over certain other providers. IPVanish has apps for all of the major operating systems, including Windows, Mac, and Linux. Our experiences with their Windows application were solid. As we pointed out above, speeds were respectable, though obviously you have to keep your location, hardware, and other factors in mind when testing. The app itself is very intuitive. There’s a ‘Quick Connect’ menu that lets you choose a country from the dropdown box and from there have IPVanish automatically connect you to the ‘Best Server’ in the ‘Best City’. If you’d like more control over where you connect, simply click on the ‘Server List’ menu, which is the next menu on the sidebar. The list view allows you to sort countries by name, response time (based on your location), load, and favorites. If you see a country you like, either click its name to be connected to the best server – or select the number to the right to pick a specific server and also see how much load each server is under. There’s also a ‘Map’ view for the servers, which does pretty much what it sounds like. And then the ‘Filters’ section, where you can sort countries by latency. The other menu of note is the ‘Settings’, where you can select your protocol, enable and disable your killswitch, set IPVanish to open on startup, and tinker with a few other options. All in all, IPVanish’s app isn’t quite as sleek as some of the VPN apps we’ve tried, but it’s still easy to use and does what it’s supposed to. Our IPVanish experience with Mac didn’t differ much from our Windows testing. Speeds across the board were good; not mind-blowing, but plenty fast. This will depend upon your distance from the servers though. The IPVanish app for Mac is also similar. There’s the ‘Quick Connect’ menu, where you can select a country and be connected to the best server for your location. Further down, the ‘Server List’ lets you sort countries by name and latency, see which servers have the least or most load, connect to specific servers, and even favorite the servers you use the most. The ‘Map’ feature is still present, where you can select servers based on their location on the map rather than a list. The Mac app also has all of the same settings, the only difference is how you access them. Rather than clicking on a ‘Settings’ option from the sidebar, you’ll click on the IPVanish logo in the top left of the app screen. As with the Windows app, IPVanish didn’t reinvent the wheel on Mac – but the program still manages to be effective and easy to use. IPVanish provides a good selection of servers, with 1,100+ in total and over 40,000+ IPs. These servers are spread across 60 countries. And as far as we can tell, all of those countries are served by physical, not virtual, servers. If you’re from South America, you might run into some problems, since IPVanish’s only servers on the continent are in Brazil – though it does have plenty in Mexico. Also, their only African servers are in South Africa. But pretty much everyone else should be well served by IPVanish’s network. Whether you’re handling sensitive data, torrenting, or just want to protect your general privacy, it’s important to pick a VPN with good security. So, let’s look at where IPVanish shines in that area – and where it could stand to improve. IPVanish is based in the United States. Now, while this may not be a dealbreaker, most VPN experts agree that you should try to avoid using a VPN that falls directly under US jurisdiction, because of its history of NSA snooping, DMCA takedowns, copyright suits, and other privacy invasions. Of course, that stuff isn’t much of a problem as long as the VPN provider doesn’t keep logs. Which leads us to our next point. IPVanish has always claimed to be a “zero logs” provider. However, in 2018, it was revealed that they had been keeping logs – and had even turned a user’s info over to US Homeland Security in 2016. This caused quite an uproar in the privacy community. But IPVanish had come under new ownership in 2017, between the time of their cooperation with Homeland Security and when that info reached the public, and the current owners insist that they’re not logging. Still, it’s impossible to be sure. And considering how important a non-logging VPN is to privacy and security, only you can decide if you’re willing to trust IPVanish’s new ownership. A killswitch is a key feature for any VPN, since it protects you from leaking sensitive data – like your online activity or IP address – if your VPN disconnects for whatever reason. In the event of a disconnect, a killswitch instantly halts all traffic until you either reconnect the VPN or turn it off. IPVanish provides a built-in killswitch on all of their apps. However, it is set to off by default, so make sure to turn it on. But note that if the killswitch is enabled, you have to either turn it off again or close the IPVanish app to connect to the internet with the VPN disconnected. One of IPVanish’s more unique features is its SOCKS5 web proxy. Basically, a proxy is like a less secure but faster version of the tunnel that your VPN uses. It’s not going to provide you with the state-of-the-art encryption a normal VPN connection does, but it can be a good option if you just want to change your location or mask your IP. For instance, if you torrent through a proxy, it will look as if the traffic is originating from an IP address that isn’t your own. One of the most important security features of a good VPN is its ability to encrypt your web traffic, which makes it unreadable by snoopers, agencies, and other third parties. And in that regard, IPVanish is quite strong, with 256-bit AES encryption. 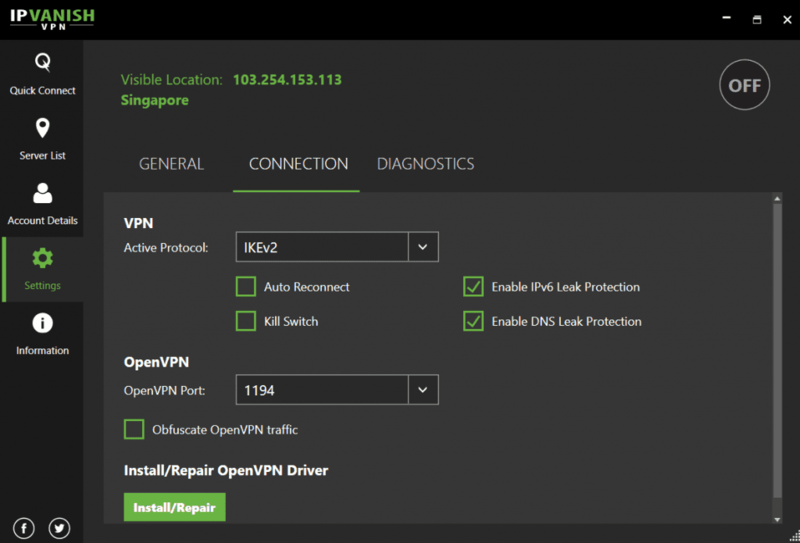 For Windows and Mac, they give users the option of OpenVPN, LT2P/IPsec, PPTP, and even IKEv2 protocols. While the other three are quite common, IKEv2 isn’t supported by as many VPN services – and it has some interesting advantages. The options for mobile users are slightly less robust. iOS users can access IKEv2 and IPsec through the IPVanish app, but they’ll need to install and setup a separate OpenVPN app to use that particular protocol. Android users, on the other hand, can use OpenVPN UDP and TCP through the IPVanish app – but not IPsec or IKEv2. Of course, it doesn’t matter how good your encryption is if you’re leaking your IP address. That’s why IPVanish provides built-in IPv6 and DNS leak protection. They also provide private DNS servers that you can use to minimize your risk. 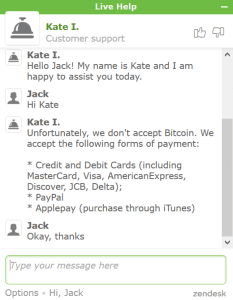 Unfortunately, IPVanish doesn’t accept Bitcoin payments. They did in the past, but it’s no longer an option. When we asked about the change in the live chat, the rep we spoke to said they stopped because of an increase in fees for Bitcoin payments. While Bitcoin isn’t totally “anonymous”, as some people claim, it does add an increased layer of protection for more privacy-oriented users. Of course, many folks are content with simply paying with credit card or Paypal, and that’s fine – but the lack of Bitcoin option is definitely a disappointment. 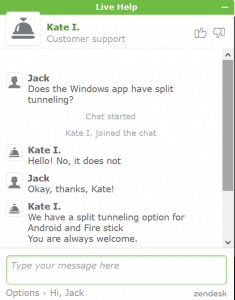 Split tunneling allows you to choose which traffic routes through the VPN and which does not. For instance, you could simultaneously torrent through the VPN while watching Netflix over your normal connection. IPVanish does have a split tunneling feature on both Android and Fire Stick. That’s a nice surprise, since many VPNs don’t allow split tunneling on mobile. Unfortunately, the setting isn’t available on Windows and Mac. This is an odd choice, since split tunneling is much more useful on desktop than it is mobile. For example, most people don’t torrent from their smartphone, they do it on their computer. But again, it’s still nice to have on Android. IPVanish advertises 24/7 customer support, with two main options for getting in touch, live chat and email. We didn’t try out the email support, which we assume is a lot slower – but we had good experiences with the live chat. Response times were very quick, and we never had to wait for more than a minute, and the chat reps did a good job at answering our questions. We looked at everything IPVanish had to offer, including its security, speeds, servers, and support. Their encryption and protocols are great, they offer a free SOCKS5 web proxy, and allow 10 simultaneous connections, which is the best in the business. On the other hand, there are questions about IPVanish’s new management, they only offer limited access to Netflix, and they lag behind the competition in a few other areas. Now, it’s time for the moment of truth: would we recommend IPVanish? The answer is… maybe. If you’re looking for a solid all-around VPN and you don’t care about the lack of Netflix and other streaming options, IPVanish can be a decent choice. However, considering that there are better VPNs – and other VPNs that are just as good for cheaper – it’s hard to give IPVanish a full recommendation.